In the Tradition of the Sufis. Unfold the Potential of your Heart. Each seminar stands on its own merit. They complement each other, in a transformative, liberating process of experiential and practical unifying insights. For more information email: wajid.gallien@gmail.com or call 206 363 5803 and leave a message. The Temple of Light, Love. The symbol of the flower of life, in this version represent in its totality what was for many centuries a secret known and shared only by an elite initiated into the inner circle of esoteric knowledge. 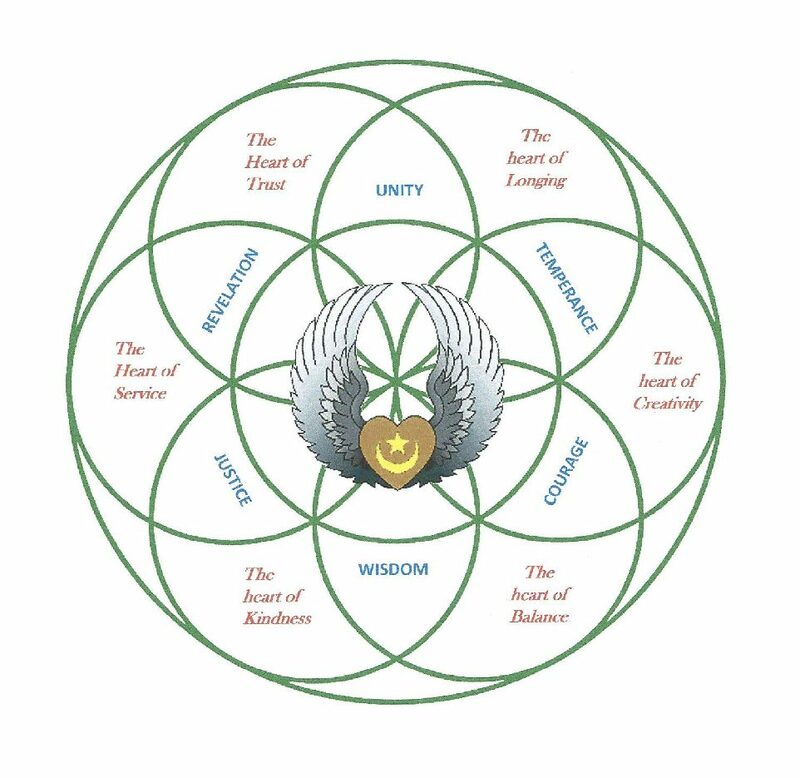 An initiation given to those who after many tests and a long discipleship, during which they progressively learned to decipher and understand the symbolism revealed to the initiate through an inner (heart) wisdom only accessible after a thorough transformation of the individual’s consciousness. Now, all this information is available, to anyone who cares to look. Within the larger containing circle are 7 smaller circles, each representing a mode of thinking and being. The progression moves from the peripheral circles at one o’clock on the right, all the way to 11 o’clock on the left. A the center of the larger containing circle is the seventh circle through which each of the peripheral circle connect with each other, a point of unity. The central circle represents the sacred inner sanctum, or the core of the teaching, in relation to each peripheral circle that progressively moves from the gross, at one o’clock, through each of the experiential dimensions until it reaches the very subtle at eleven o’clock. The inner circle therefore is the quintessential source of the six peripheral circle. It holds the four elements of earth, water, fire and air in their essential condition which throughout the ages have been recognized in their very subtle condition as archangels, and as such where given names. In the ancient traditions there are known as the four pillars of the throne of God, or of the throne of Mercy, and a few other names depending on which tradition we focus. This process of learning for the most part starts from the lower, outer mode of consciousness, in the same manner that we attend different degree of schooling, each time relying on the previous learning to move on to the next, until through persistence we reach the top levels of education, perhaps a PhD. Yet, there are a number of stories in the ancient traditions that relate an event whereby an individuals with no previous interest in esoteric or religious things, has a sudden transformative experience producing a form of revelation, which provokes in them an urge to share, to understand and make sense of it. All of this to say that mostly we start at the bottom, but occasionally someone experience a reversal and start from the nothingness of the all-pervading. There is according to ancient tablets and later found in scriptures, at the center of the four pillars holding the throne of God, a first creation of Divine manifestation, “the two”. Two opposite forces, attracted to each other in a constant all-consuming cosmic dance. The essential source of all things, known and unknown, in our universe. In other words we might think of it as the two positive/negative poles of the beginning of time. Henceforth, the cause of time and space, as far as we know. We find this dual energy in all things created in both the Microcosm and Macrocosm. In other words to quote an ancient saying “as above, so below”.. I have borrowed the Taoist symbol of the Yin and Yang to represent this extraordinary source of life, but many different representation can be found in the arts, science, medicine, religions, etc. In Sufism they are addressed by Sufi Hazrat Inayat Khan “There is the law of attraction of each to its opposite. There are two great forces in nature: the creative force and the receptive force that answers to it, or the active force and the passive force, Jalal and Jamal”. What is important is not so much knowing what it means and that it is out there, but being able to observe their process and the influence they exerts on our life. “We” as we think we are, are dominated by this two energies / forces and react to life in ways that we can only free ourselves from, when we finally learn to observe them, and to recognize their unconscious working, leading us to eventually take charge of our automatic reactions, through acts of will, that foster action. In other words we are in a somewhat sleep induced automatic reactive mode, the sleeper needs to awaken. Which might happen naturally through a chock to our system or through a sense of emptiness that prevails no matter how successful we might be. Sometimes it will be a chance contact with a person that awakens in us a deep longing that we have ignored for too long. But I digress from the symbolical description of the flower of life. If you have looked at the symbol you will have noticed that each peripheral circle has an attribute representing a stage of understanding. Starting with Temperance, followed by Courage, then wisdom, Justice, Revelations, and Unity. These are key word or clues to what is needed to explore and understand the state of being represented by that circle. They further interact with their opposite circle. So you have Temperance balanced by Justice, courage by Revelations, Wisdom, by Unity, and the same in reverse. These are as it were intentional key words to guide and concentrate our consciousness toward a state of awaken meditation. 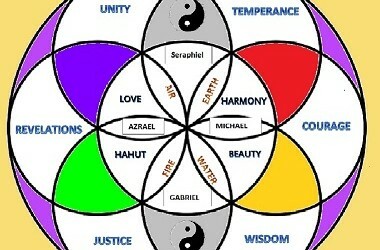 Which means that we are able to intuit the relationship of the Yin/Yang, the Jalal, Jamal in relation to each circle that is symbolical of a state of consciousness. There are more words in the central circle, such as Harmony, Beauty, Hahut (most high spiritual attainment, or Samadhi) and Love. These are subtle emotional conditions one must be prepared to experience, to receive the most valued key of the interactive domain of the two great forces in nature: the creative force and the receptive force, or the active force and the passive force, Jalal and Jamal, or the Yin and yang. Considering that only so much can be said in the present form, we must take counsel from the Sufi literature reminding us of the need for the student to have a friend on the journey, a guide to help cross bridges from one state to another, to avoid entanglement in a mire of speculations that can lead astray the traveler on the path of the heart. This new book offers an in-depth look at the fabric of the veil concealing the countenance of the Divine Presence. A guided journey to create the inner Temple in order to discover stages of our awakening. An exploration of the causes of our inner conflict through understanding of the Light Mind, Dark Mind internal conversation. At this stage in our meditation we are required to change our mode of thinking. As we look inwardly into a world of light energies and forms, we discover in the silence of our experience an expanding universe in which, up and down, higher and lower no longer defines our experience. We are in a realm whereby each plane of consciousness is made of the sum of all its parts, and itself a part of a greater sum. An expanding universe is curved, which prompted Buckminster Fuller to suggest we use, in and out, instead of up and down. In a similar fashion the concept of hierarchy no longer matches our realization, and another word is progressively replacing it. Rupert Sheldrake in the book The Physics of Angels writes “ I think “holarchy” is fine, because actually what “hier” means (from hierarchy) is not just sacred but holy; and “holy” has the same root in English as “whole”. Likewise in Greek holos means whole.” Therefore in a holarchy we have a better descriptive experience of a curved inner space made of the sum of its part, each, a part of a greater sum. Prelude to the December 14th Seminar. I have occasionally spoken of the fact that we are a product of our environment, often with the expectation of an understanding that varied according to the subject I was addressing at the time. Considering the importance of understanding the place and influence of conditioning and our propensity toward simplification, to interpret a statement or word to its most common use, it behooves us to have a more detailed and yet broad understanding of this idea. First we need to look into the primordial environmental start of this process, which happens to be the time our parent have the sexual encounter that will provide the two elements carrying the DNA that will be the basis of the structure that will produce our physical body. There is no denying that we carry the imprint and are the product of that first primal exposure in the environment of our mother’s womb. Because during our life we have a psychological need to feel some sense of control and a desire to account for our destiny, there has been talk in the spiritual community about our having a choice on the karmic possibility of our life, that we chose the parental situation that will provide the learning and exposure to certain experiences. I mention this because it might be true, although my penchant from experience, as a variation on that theme, is that we are attracted by the sympathetic resonance of our parents reflecting our own as a divine spark, which is how the spiritual world seems to function. Being that most of us cannot personally ascertain the reality of this belief, I leave it at that, a choice of personal belief that offers a supporting mode of thinking from that ideology. From this humble beginning we progressively become a conglomeration of impressions, nutrients, emotions, sounds etc. picked up from the immediate environment of our mother, and less directly at this stage, our father through his influence and relationship with our mother and the environment they jointly create. All of this at a deep experiential level, that will remain with us throughout our life, unless at some point we feel the need for a purification in order to reconnect with the original divine spark, from which all started. After a gestation of nine months we are delivered into the world of direct experiences, hopefully under the emotional, psychic, and physical protection of our parents. This is when our inherent inner potential instinctively begins exploring our immediate world. From innocence, at least of the world of form, and with an inherent curiosity, inspired by an original intention (yet to be discovered), we begin a process of informational absorption, limited only by our brain capacity and rapidity of assimilation. Slowly at first, but progressively faster, we acquire (instinctual) knowledge and (intellectual) education. All of which eventually brings us to a bifurcation on the road of becoming, a moment in time in our life that is not of the realm of time, but circumstantial. In other words this instant will come and go many times, as long as we don’t recognize the opportunity offered by the challenge of the bifurcation. If one of this moments happen to have all the right ingredients, the sleep walker may awaken. The important question is, what does awakening mean, what is it that changes in a person in this process from sleep to awaken? To comprehend the process of awakening we need to go back to the early years of our journey, when our brain and our innocence, needed to rely on trust and accepted words and concepts at face value. We were given meanings and definitions on words and thoughts, according to our parents, friends and school teachers, an understanding, that also made sense to them, as they acquired their information in the same manner from their parents, friends and school teachers. We observed that society used the same words and concepts and that it worked for people. That there was acknowledgement and that grades of proficiency were given according to familiarity and proficiency of use. Although for some, the social norm of learning did not work well. From the start, they found they had a different association with words and thinking. To them the way the dictionary meaning of words was used seemed limiting, when using them they felt a superficiality, which boxed them in, hiding a deeper dimension of understanding that they experienced in painting, music, dance and other artistic forms of expression. What is the solution, which has been spoken, hinted, shared, by mystics, be they masters, saints, prophets or other? Which of course, society loves to hate, or hates to love, depending on what they have to say. The solution is to crack open the box of our conditioned mind, the very framework that has provided some illusory sense of security. To daringly experience the far reaching radiance of our own intuitive intelligence, to enter into the uncertainty of a reality, that has a depth beyond our rational, that requires an emotional availability to the shattering of one’s perspective of the world, on the rock of truth. Yes, it might be painful, or as painful as one tries to resist, due to a deep fear of the unknown. But the gain is the discovery of an emotional depth that reveals an experiential knowledge that will takes us to the far edge of our humanity, to reach into the purpose of our life, in a dimension of being that harbors no dependency no analysis, just a quality of silence to one’s listening.